Product description: Our Easy Leather Restoration Kit cleans and restores color to your leather products. Shop today! At Furniture Clinic, we care about helping you find the easiest ways to get the job done. We believe that our industry is all about balance: we have found that the more thorough our product development initiatives become, the easier those products are for our customers to use. So, although we could tell you all about our industry-leading product testing and development methods, we’d rather spend time telling you about the product on the other end of this balancing scale – our Easy Leather Restoration Kit. Our Easy Leather Restoration Kit combines the powerful solutions of two of our top-rated products: Leather Ultra Clean and our Leather Re-Coloring Balm. Designed to thoroughly clean your leather first, then restore it to a state that looks brand new, our Easy Leather Restoration Kit is the product you need when your leather is desperate for a facelift. Leather Ultra Clean, our highly-rated leather cleaning product, removes the dirt and grime that are deeply engrained in your leather. An essential component of this two-part kit, Leather Ultra Clean ensures that your leather is clean, stain-free, and ready for the second half of our efficient two-step process: our Leather-Recoloring Balm. How do you follow up one of the most effective leather cleaning products in the industry? With one of the top-rated leather recoloring products available today, of course. Our Leather Re-Coloring Balm renovates the color and appearance of your leather, applying a vibrant approach to restoration. 21 unique colors are featured in our Leather Re-Coloring Balm Collection: all available online and ranging from dark to light shades. This product completely absorbs right into your leather, preventing the formula from rubbing off on your clothes. The Leather Re-Coloring Balm is a great fit for scratches in leather that are a lighter shade than the natural color of your furniture: if darker, you’ll want the Leather Touch Up Kit. 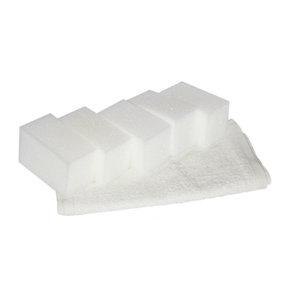 With this product, we recommend you test the ability of your furniture to absorb liquid prior to purchasing. To complete this test, apply a small drop of water onto an intact section of your leather, and see if the water soaks in. If the leather is not absorbent, our Leather Touch Up Kit (for smaller areas) or our Leather Colorant Kit (for larger areas) would be a better fit for you. If you’re like us, you like to receive the value of guarantee and longevity from each of your purchases. 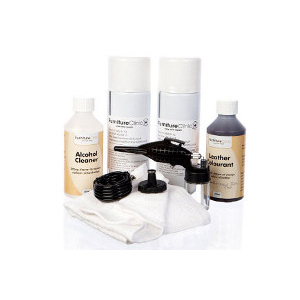 Our Easy Leather Restoration Kit is the industry-leading product when it comes to coverage and shelf-life, a guarantee that our customers have quickly come to expect, and appreciate, from the Furniture Clinic brand. Furniture Clinic is here to not only make leather restoration easy, but also help you make your decisions easier, too. If quality, longevity, and a cost-effective solution are three of the things that matter most to you, buy our Easy Leather Restoration Kit online today. Leather Restoration Kit can be used on all different articles of leather, from furniture and car interior to clothes, shoes, handbags and even equestrian leathers. It works on all colors of leather and all different grain types. Thoroughly clean and restore color to a full three piece suite! Clean the leather first before applying the Balm, using the Leather Ultra Clean. I owned a Dark Red Leather Sofa, ottoman and Recliner and gave it to my parents when I got divorced I didnt have room for it anymore. My Parents recently downsized to an Apt. and Knew I had room to have my furniture back after 7years it was faded on the cushions and the ottoman had faded and had dog scratches on it. So I Did some research. And read the reviews on your product to restore the color and Thank God I came across your Product I was In Awe how it restored the rich color and luster back to my Beautiful Furniture !!!! It looks like new again. I am just Thrilled with your Product Thank You !!!!! We had an oil stain on our leather couch left behind by chocolate. The product did exactly what was advertised and removed the stain completely. This is even after we had professionals come out and fail to remove the stain. Very pleased and recommend without any reservation. Specially formulated colors to re-apply the color to worn antique and rub off style leathers - the most popular being the Chesterfield sofa.